Last week I foolishly decided on Dec 20 to make up a couple of very last minute presents. I often make gifts, but have been turned off in recent years because I never but never see what I make in one of their homes. Maybe I should take a hint. Probably, definitely. But Christmas was being done at my house, and both sides of the family would be there. It would be more awkward to make something for one and not for both. Seriously, it is not like I had the time for this. 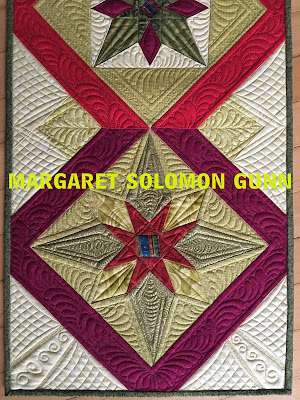 I have a couple client quilts I really needed to get quilting on, but I have been working out issues on my new machine, and one of them is still prohibiting doing anything very large. Last Sunday, I sketched these runners up, and had them mostly cut out within about an hour. No time to overthink anything. They are simple and use the pretty fabrics as the "show". I had the tops pieced within 3 hours on Tuesday, still quilting on a client quilt. My window to do the quilting was when the client quilt was done...Wednesday. Keep it Simple - that was the rule. I have made a couple of other seasonal runners for my MIL - spring and fall I think. This is the Christmas/winter one. Not sure if I hit the mark or anywhere close to it judging by her always questionable expressions while opening, but I like it. It has some great red and gold fabrics I have hoarded for many years. The other runner is in blues, my mom's favorites. It's dark, but hopefully not too dark. Gray is something of an unlikely choice, but it lightens up the design, and shows the feathers. These were done with Glide and YLI Polished Poly threads. Single batting. These dots have the worst machine applique known to man, but I lacked time for the handwork. I even did both bindings by machine. Happily, the binding is just about the best machine binding I have ever done. Not having the corners did help. Christmas is just not my holiday. Too much greed, and hyperness. Why can't people just give one appropriate gift, selected specifically FOR the recipient? It always bugs me when a gift is chosen because it is something YOU like, but then the recipient is like "huh?" I always get these. There's a few that are special, and then piles of not-so-special. We all need to work harder to just seek out the special, Oh well, it is all over. Everything but the lingering 400 boxes in our garage, and the stuff all over the living room. I need another nap just thinking about it all. Anybody with a 14, soon-to-be-15 year old knows that they don't willingly say "take my picture", so we have to hold onto the few we get. It may have come with a bribe of Thai food. I'll never tell. 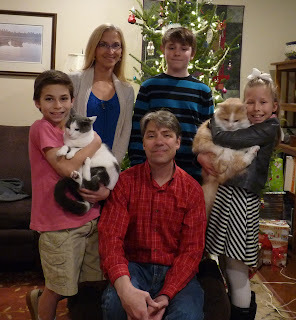 And here you have it, the 2016 forced-smile family photo. "Smile once, and we can all go eat. Be goofy and grumpy and we'll try this all night". For those of you that don't know, I sold my Fusion 2 weeks ago. It was a bittersweet moment as the new buyer and I took her apart, a month more than 7 years after I first put her together. 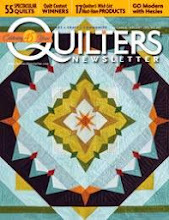 We made hundreds of great quilts together and started a business together. What you may not realize is that while I was in Houston, I bought a new machine...a new Fusion! It was installed 10 days ago - just 3 days after the old one headed to its new home. I have been working on a few of my own quilts to "work out the kinks", before tackling a custom client quilt. I finished a couple of small things 2 days ago when I got that wild hair to do something for myself. Somewhere near 6 yrs ago, I made this runner for myself. The blocks were made from fabrics used in a block swap I participated in. For whatever reason, I had 9 or 10 leftover blocks after the quilt was made, so a few runners were made. I kept one of them. This would have been sometime during the first year I had the old longarm. These particular star blocks were actually made by me, although most of the blocks on the quilt were made by others. You'll see that in a moment. I quilted it fairly simple. It was pretty, but nothing terribly special. A 50 wt So Fine thread was used. This thread is great, but it is flat and appears somewhat utilitarian. 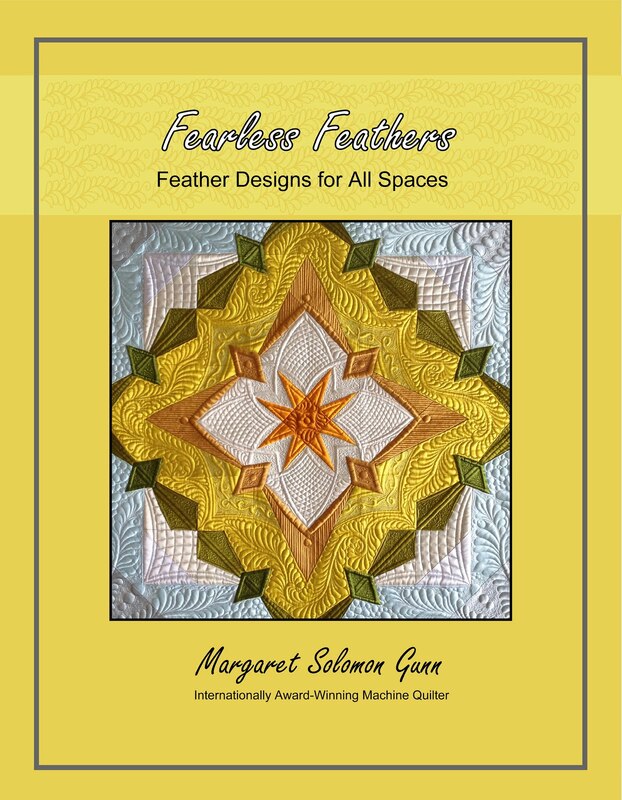 I didn't know how to make feathers then (or not at all well!). It was also apparent that my machine was having a timing issue too, as there are places of skipped stitches. What always bothers me is that when clients come to drop off or pick up quilts, we use my dining room. It always has a runner on the table, and not a one of my runners were quilted in recent years. They may have nice colors and piecing/applique, but the quilting is not in any way indicative of what I can do. I am often ashamed. It was time to rectify that. Here is the quilt where most of the swap blocks went -- all in the same color scheme which I love. I quilted this right before I went to the Handi Quilter retreat in the fall of 2010. It was done knowing it would likely be in the ad that was being shot during the retreat. I tried to quilt it as good as I could! 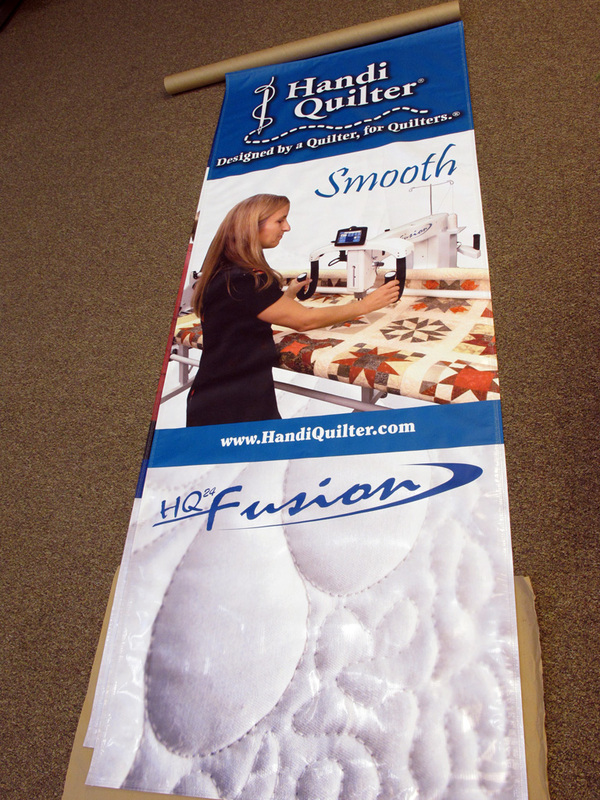 Here's a peek at what the ad looked like...This is actually a banner that hung at trade shows. So, rather than doing this the right way (remove binding, then skin the quilt top from the batting and backing, I foolishly did it the hard way! I basted fabric to the binding and loaded it all to the longarm. I then proceeded to remove the quilting section by section, requilting as I went. Had I done it the right way, I'd have added a layer of batting...something it really needs. Oh well. I used Glide threads on all of it. This 40wt thread has a pretty sheen, giving this a more formal look. It is also much more densely quilted -- more to my aesthetic. There's much better ditching, and more ruler work, feathers and cross-hatching. It is just a nicer quilting, representative of my added 93 million stitches of experience! Yup, that was the stitch counter when my machine was sold. If you have gotten this far, then I have a very important thing to discuss. You may have discovered that you are not able to right-click and save photos from my blog. Many people do this so that they can repost them somewhere else. Less reputable folks do much worse. I believe that these are my work, and my property, and I don't want people to do this. You may also have noticed that I have an explicit copyright statement on the right sidebar too, asking you not to use my materials or photos without my consent. Artists should not have to write this, but I have. And I do expect others to respect that. 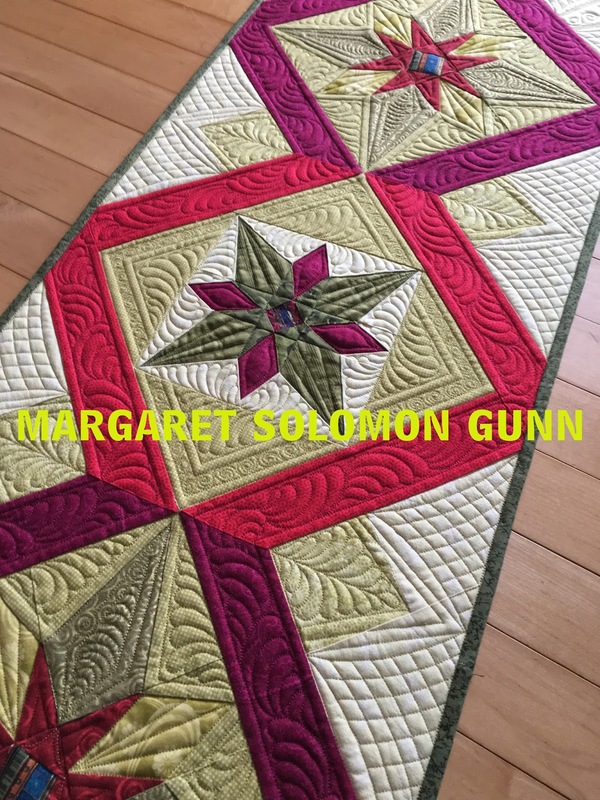 I make quilts for show, and create techniques that I teach, and do NOT want them to be widely dispersed by others. This is my livelihood. Please respect it. I have recently discovered many photos were taken by a website called QuiltersHub, as well as many others that post them to Pinterest. 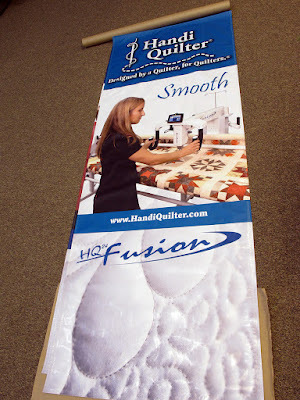 Quilting Hub posts quilters photos, but receives income for every person that visits their site. They are profiting off of us, without our consent, and it is wrong. Please take note that I will stop sharing things if this continues. The large watermarks on my photos above are really irritating to look at, I know that, but I don't want my information copied against my will just because some of you know how to do it. Too many people that post and repost to Pinterest don't bother to give credit to the artist. Even if you do credit the artist, GET THEIR CONSENT! Don't expect to get Snow Day Tips too often. I certainly hope I don't have to create very many of these!! Not being a fan of that white crap (and the icy freezing rain stuff that is falling on top of the 6" that came down last night), I don't have too many things that can be productively done today while all 3 kids are home. My new long arm is being installed tomorrow, and I had planned to go out and start my xmas shopping today. That plan was foiled! 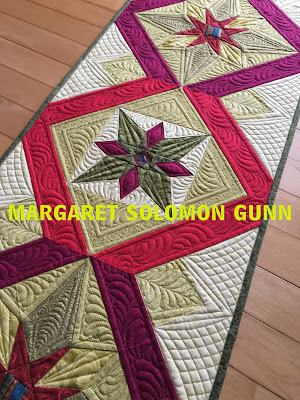 So, here you go - here's a post getting back to the roots of what this blog used to be - something quilters could get advice and tips from! I have been hand appliqueing these borders since the beginning of last month. The will go onto a quilt I pieced earlier in the fall. While I finish the stitching on the 3rd and 4th, I removed the marks from these. As is so often the case with applique, there was a little distortion of the background fabric after all the pieces were attached. I removed marks, and tried to press them, but they still looked like this. Never fear, though, there is always a solution, and one that I have used before, so I was confident it would work again. I took the borders, and pinned them onto foam core board, taking care to keep the first edge nice and straight. It is not stretched, just pinned on. I ease the opposite side into what looks to be the right location. I am pretty sure that the bias vine is the culprit of this issue, so as I get the opposite long side of the border pinned, I also pin the vine . It is being slightly stretched, so that the entire border will again lay flat. As an aside...There are many ways to make these vines, one in particular leaves no stretch at all. BUT...I used the bias-maker tools, which of course sometimes do stretch the material. Had I waited 3 weeks to applique the vine onto the quilt, the vine would have probably shrunk back to its original length (facetious - maybe it does not really take 3 weeks). But, again, I immediately basted the vine onto the quilt so it could be appliqued on. Once the pins are all in place, and the border is nice and flat, I spray the border until it is all soaked. 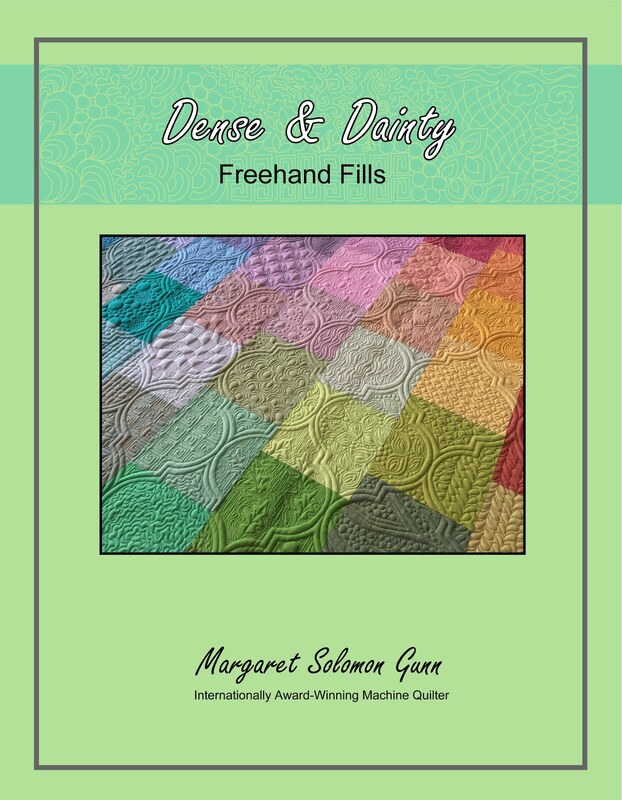 This is when knowing that all fabrics were in fact presoaked leaves me without so much as an iota of concern that these gorgeous fabrics might bleed! When the border is dry (I leave it 24 hrs), remove the pins. It will be flat and perfect!! It seems hard to believe it has been several weeks since I last posted, but I have been technology challenged. My computer died, without little warning. It was related to an automatic Windows update that it just couldn't work right with. The reality is though that the computer needed replacing. It has just been a challenge replacing ALL of the software my older computer had. 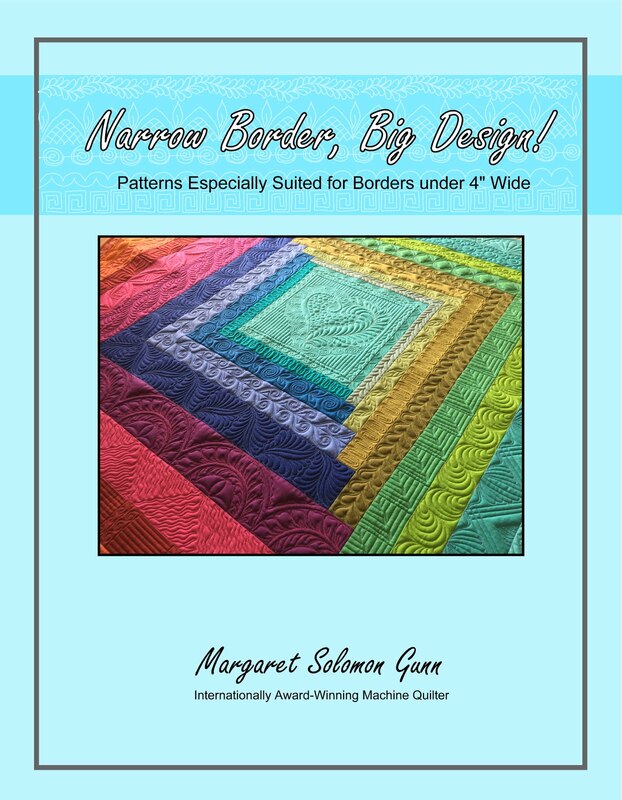 My longarm has sold -- it will all be official this weekend when the buyer comes to pick it up. I am very excited to be getting the new one set up next week! I just hope the new buyer knows how great that machine is. 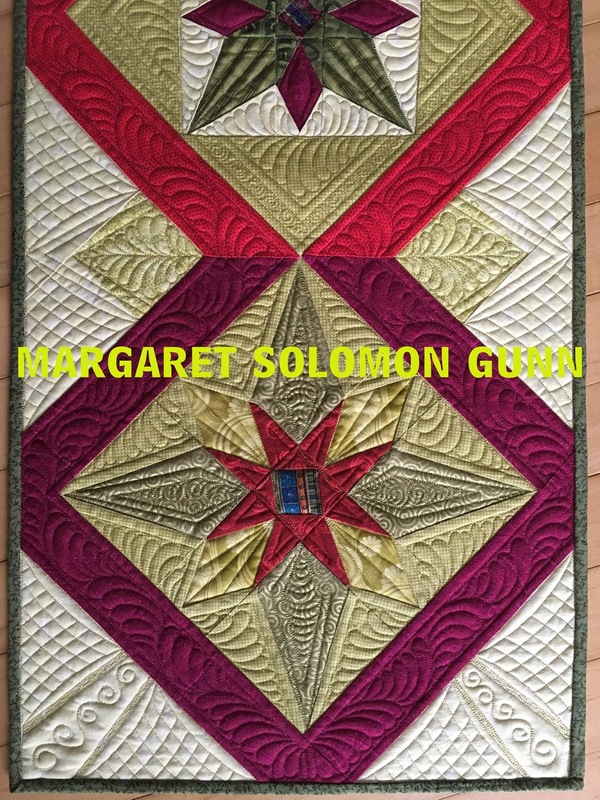 I have done a fantastic custom quilt that I am not really allowed to show. I am hoping that a snippet of the backside does not get me in trouble. 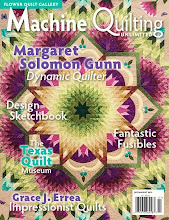 Since my machine is going away on the weekend, I cannot load the usual jobs I quilt because they won't be done in time. I did this small-ish class sample last week. The applique is mediocre at best, and not done by me. 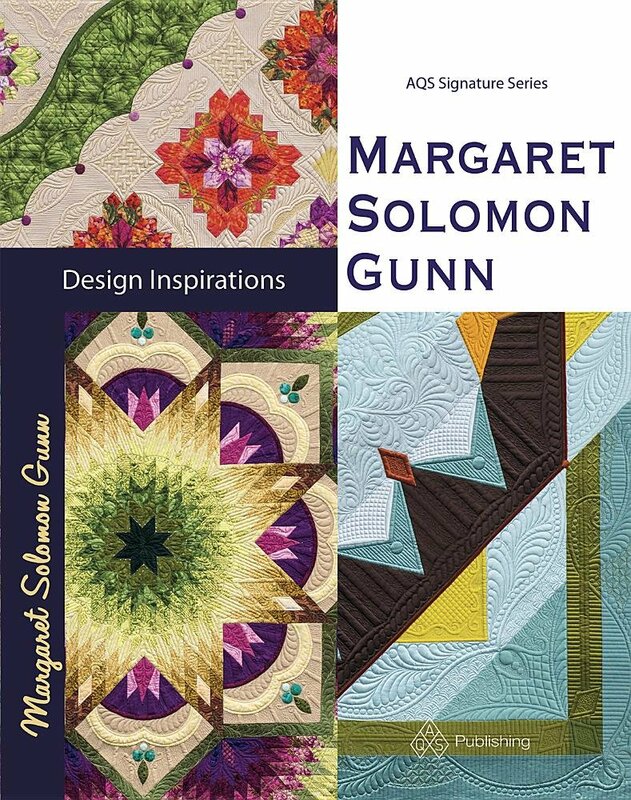 My class is A is for Applique and will be a design-centered class with a focus on applique quilts. Christmas is coming; the snow that fell today is a cruel reminder of that. If you've been around long enough, you know how much I really loathe the holidays! Never the less, my youngest wanted to go see Santa yesterday. He's a really good Santa too. This past weekend, I whipped up a quick sample from a couple charm packs of Shot Cottons. 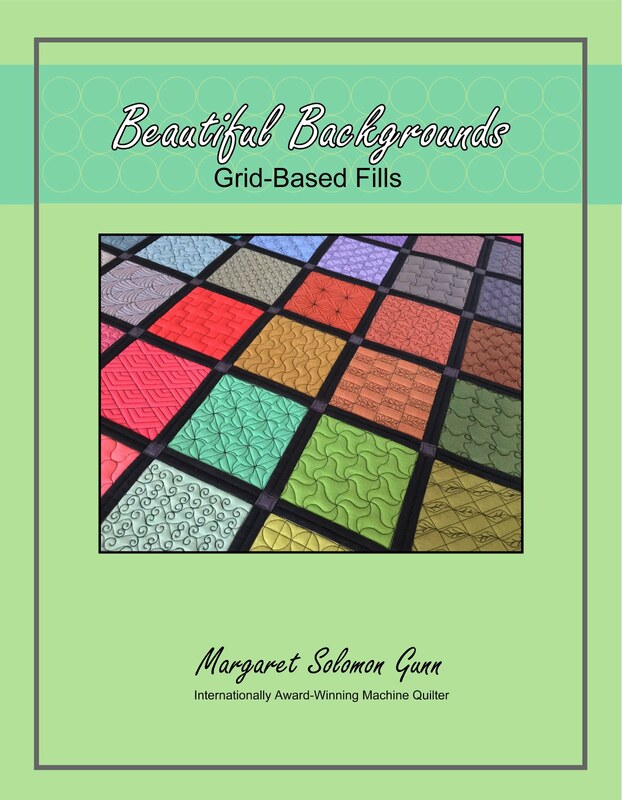 It is in the process of getting a bunch of grid-based fills. It's not exactly a fast task as I have half of the piece remaining! Sneak peek... Yup, black thread is daring! if not crazy. I will be back soon...with more interesting things to show!